G: Klay Thompson, Jr, Washington State (19.6 PPG, 5.1 RPG). Josh Smith, Fr, UCLA: Smith is the biggest incoming recruit in the conference, in more ways than one. Ranked the 20th-best recruit in the 2010 class according to ESPNU, Smith also tipped the scales at somewhere over three bills when he stepped onto the UCLA campus this summer. Immediately, head coach Ben Howland put him in a conditioning program and Smith changed his dietary habits as well, putting him on the road towards dropping 40 pounds already. Paired with his soft hands and quick feet, the trimmed-down Smith will play a vital role in the Bruins’ attempts to bounce back from last year’s brutal campaign. 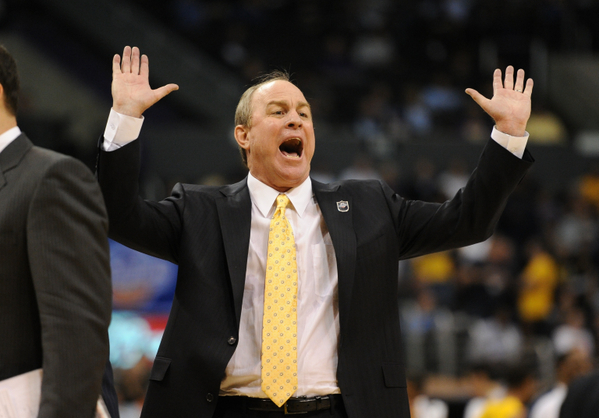 UCLA’s Ben Howland is among several Pac-10 coaches looking to make the conference an NCAA Tournament threat again after a poor showing in 2009-10. Pac-10 Blues: Last year, the Pac-10 was saved from the indignity of receiving only one NCAA Tournament berth when Washington won nine of their last 11 games of the regular season, then proceeded to win the Pac-10 Tournament to clinch the automatic berth. Together with regular season champion California, the Huskies represented the Pac-10 well, advancing to the Sweet 16 before losing to eventual Final Four team West Virginia, while the Golden Bears fell in the second round to eventual champion Duke. However, the Pac-10’s limited success in the tournament did little to hide the fact that last season was a down year across the conference, and with 11 of last year’s top 20 scorers, and nine of the top 20 rebounders gone, it doesn’t seem that the talent level across the conference is ready to skyrocket. Stability and Youth: But, while there aren’t loads of household names up and down the rosters in the conference, there is some stability, as only Oregon welcomes a new head coach (Dana Altman, formerly of Creighton) and teams across the conference average a total of 3.2 returning starters. And there is plenty of youth, with just 17 seniors on rosters across the conference. Schools will need to see their youngsters step up quickly for the Pac-10 to improve upon last year’s showing. There is a bright side here, though. Even with five members of last year’s all-tournament team (all except the tournament’s Most Outstanding Player, Isaiah Thomas) and six of the ten All-Pac-10 first team members having graduated, most teams around the conference, with the significant exception of Cal, return the majority of their production – eight of the ten conference schools return more than 50% of their scoring production, and nine of the ten return more than 50% of their rebounding production. If the kids around the conference can put some of that experience they earned last season to use, this could be a much-improved conference, as the veteran coaches around this conference have proven their ability to coach up their players. There are five coaches in the Pac-10 with more than 300 career wins, and that doesn’t even include some of the most respected young coaches in the land like Sean Miller and Lorenzo Romar. While the talent level seems to be down across the conference, expect this lineup of stellar coaches to get the most out of what they do have. Last Roundup: This season marks the end of the Pac-10 conference. Next year the conference will welcome Colorado and Utah, officially becoming the Pac-12. In the process, plenty of tradition will be discarded: no more home-and-home round robin and the resultant crowning of a true regular season champion, the biggest change. There will be years where UCLA doesn’t visit McKale and Oregon won’t visit Hec Ed, for instance. But in the long run, the conference will add a Utah program that has had some significant success over the years (including a run to the national championship game in 1998) and a Colorado program that, well…hey, they made a Final Four in 1955, I’m told. In any event, come 2011-12, basketball season around the conference will have a different feel. Washington (NCAA Seed: #5): The Huskies are pretty much the de facto favorite, given that last year’s regular season champion Cal lost about 85% of its scoring, but Lorenzo Romar’s team, despite having plenty of talent, still has some question marks. Not in question is the team leader, 5’8 junior point guard Isaiah Thomas, a dynamo who is the team’s leading returning scorer and an interesting personality. Paired in the backcourt with 6’0 senior Venoy Overton (8.5 PPG, 3.1 APG. 2.9 RPG), the duo are undersized but form an intimidating pair for opposing ballhandlers, with the quickness and aggressiveness to get up into their opponents, keeping the opposition from getting comfortable in the half-court set and forcing turnovers which the Huskies can use to jump-start their transition game. They can be overpowered by bigger guards in the half-court game, but use their quickness to good advantage defensively. On the offensive end, Thomas plays with a style that belies his stature, getting into the lane and drawing fouls or finishing in often spectacular ways. The Huskies also return sophomore guard Abdul Gaddy (3.9 PPG, 2.3 APG), the second-ranked point guard in the 2009 recruiting class, who struggled finding his rhythm in his rookie campaign. Should he get his swagger back and become a consistent offensive force for Washington, they could have one of the stronger backcourts in the nation, with junior Scott Suggs (4.7 PPG, 1.2 RPG) providing depth and a good long-range threat. However, up front the team still has something to prove, given the graduation of last year’s leading scorer Quincy Pondexter and the retirement from basketball over the summer of forward Tyrese Breshers due to medical issues. Matthew Bryan-Amaning (8.8 PPG, 5.9 RPG) and Justin Holiday (5.9 PPG, 4.5 RPG) figure to start at the forward spots, giving the Huskies an undersized but athletic starting five. Bryan-Amaning will need to prove himself capable of taking over Pondexter’s role, but all signs show that he is ready for that challenge, as he finished his junior season strong and was one of the big reasons for Washington’s improvement down the stretch. Depth up front will come from 6’8 junior scrapper Darnell Gant (2.5 PPG, 2.4 RPG), 7’0 transfer Aziz N’Diaye and 6’6 wing Terrence Ross, one of the conference’s most heralded newcomers, and a guy who could be an offensive weapon immediately for Romar, provided he can earn the minutes. In a conference where the talent level is presently in question, there is little doubt that the Huskies have plenty of talent. But they’d like to come out of the gates more quickly than they did last season and prove that they are ready to win on the road on a consistent basis, something they struggled with in 2009-10, when they lost their first seven games away from the Hec Ed. Odds are, they’ll be improved in that area due to an extra year of experience for their hyper-talented backcourt, but they’ll have a good early season test of that theory when they travel to the Maui Invitational during Thanksgiving week. Arizona (NCAA Seed: #9): The proud Wildcat program has taken a bit of a fall of late. In the aftermath of the end of Hall of Fame coach Lute Olson’s career and a couple interim coaches, the school’s streak of 25 straight years in the NCAA Tournament ended last season in Sean Miller’s first season in the desert. But, given Miller’s history of success in his short coaching career, Arizona fans expect last season to be little more than a blip. The heart of the team will be their five-player sophomore class, led by leading returning scorer and rebounder Derrick Williams, an undersized power forward at 6’7 who took home last year’s Pac-10 Freshman of the Year honors. Williams is a strong and athletic finisher inside who is still a work in progress without a whole lot of a game outside of the lane, but he is an indefatigable rebounder and strong post defender who converts a high percentage of shots and gets to the line on a regular basis, although he could stand to improve upon his 68% rate there. Williams will again be a key cog in the Wildcats offense, but classmate Lamont “Momo” Jones (6.6 PPG, 1.8 RPG) could have the most pressure on him, as he takes over the point guard role from departed senior Nic Wise. Jones had a predictably up-and-down freshman season, but got more comfortable as the season went on. His outside shot is not yet a thing of beauty (just 19% from three-point), but he is a quick ballhandler and a capable distributor. Wings Solomon Hill (6.7 PPG, 4.4 RPG) and Kevin Parrom (4.6 PPG, 4.2 RPG) are two more second-year players who will compete (likely with each other) for a starting role, with Hill having the edge as the returning starter. Both are long and athletic slashers who will need to improve their shooting and settle into their roles, while the fifth member of last year’s recruiting class, 6’10 center Kyryl Natyazhko (1.9 PPG, 2.0 RPG) will provide depth up front. Likely paired alongside Williams in the starting frontcourt will be the team’s lone senior, Jamelle Horne (9.4 PPG, 5.6 RPG), an athletic defender who has grown nicely into his role on this team, having put aside a penchant for boneheaded plays early in his career to develop into a rock-solid veteran for the club and a pretty consistent three-point shooter. Junior off-guard Kyle Fogg (11.1 PPG, 3.1 RPG) is the team’s fourth returning starter and should maintain his role as a solid defender, long distance threat and tertiary offensive option. While there is still a ways to go for this storied program to return to its glory days, Miller and his band of youngsters have things headed in the right direction, and if this group takes a step forward after getting comfortable with their playing time last season, that NCAA Tournament drought could be a very short one indeed. UCLA (NCAA Seed #12): Last season was a mess for Ben Howland and his team: losses to Cal State Fullerton, Long Beach State, and an embarrassing blowout loss to Portland on Thanksgiving Day, uninspired play contributing to uninspired fan support, a midseason defection by the team’s best post player and then struggling through an 8-10 conference season on the way to a 14-18 record that was best forgotten – it was a humbling experience for a program just a year removed from their third straight Final Four appearance. And many of the question marks that plagued the Bruins throughout 2009-10 remain, with the situation at point guard chief among them. Junior Jerime Anderson (5.8 PPG, 3.4 APG) came to Westwood as part of a highly touted 2008 recruiting class, and much like the rest of that class, has simply failed to deliver on his potential. Assigned the tough challenge of taking over UCLA’s point guard duties from Darren Collison, Anderson got off to a terrible start in their season-opening loss against CSUF and never really regained his confidence or showed much improvement as the season went on, eventually forcing Howland to move Malcolm Lee (12.1 PPG, 4.4 RPG, 3.1 APG) over from the two to man the point. The Bruins struck out on a couple of high profile point guard recruits this offseason, but did wind up with junior college transfer Lazeric Jones who is expected to win a competition with Anderson for the starting spot. Jones is a much better defender than Anderson and a more explosive offensive player, but the Bruins still hope Anderson will come around and earn a significant role on this team. As far as Lee goes, his experience at the point will prove valuable for him, but the Bruins need his contributions on the wing in order to succeed this season. He is a long and skinny slasher who is most effective in the mid-range game; his 25% rate from three-point land shows a need for improvement. But the strength of this Bruin team, and their best hope for improvement to the point of NCAA Tournament consideration, is the talented frontcourt, with an expected starting lineup of freshman center Josh Smith with sophomores Reeves Nelson (11.1 PPG, 5.7 RPG) and Tyler Honeycutt (7.2 PPG, 6.5 RPG, 2.7 APG). Honeycutt bounced back from a stress fracture early in the season last year to become the Bruins’ most versatile player, perhaps the team’s best defender, a savvy playmaker and a surprisingly good rebounder for a slim 6’8 wing. Nelson proved to be a tenacious interior player, scoring at a highly efficient rate inside, and the addition of the skilled and powerful big man Smith should give opposing big men plenty of trouble. While no one expects this UCLA squad to turn into a national championship contender overnight, if you squint real hard, you can see the first little glimmers of a team that could remind you of some of Howland’s Pitt teams, but they’ll need to prove themselves first and foremost on the defensive end, in order to contend for postseason play. Washington State (NIT): Things were looking bright on the Palouse early last season, as the Cougars ran out to a 10-2 record in non-conference play behind lights-out shooting from wing Klay Thompson. However, a closer look revealed that WSU was simply taking care of teams from the bottom half of Division I while dropping games to higher quality competition. When conference play rolled around, Thompson’s scoring average dropped decidedly (from almost 25 PPG to just 16 PPG in conference) and the Cougars lost 12 of their last 16 games. Thompson never failed to score in double figures in non-conference play, but was held under ten six times by conference foes. But, with all five starters returning and over 75% of their scoring production due back, Ken Bone’s club could make some noise in the conference. Thompson will clearly be the go-to guy again in his junior season, but sophomore point guard Reggie Moore looks like the real deal after averaging 12.7 points and 4.2 assists per game as a freshman. Up front junior power forward DeAngelo Casto is an athletic playmaker who led the ream in rebounds (7.0 RPG) and the conference in blocks (2.2 BPG) last season. Juniors Abe Lodwick (2.5 PPG, 2.5 RPG) and Marcus Capers (6.9 PPG, 4.1 RPG) round out a good starting five, but the bench remains something of an unknown. For the Cougs to challenge for an NCAA Tournament berth, somebody, likely Moore, will have to become a consistent secondary option for Wazzu in the halfcourt to take some of the defensive eyeballs off of Thompson. Likewise, the Cougars were not a very good defensive team last season (their tempo-adjusted efficiency ranked just 155th in the nation) and they’ll need to make significant strides in that area in order to gain a first division Pac-10 finish. Arizona State: A year after losing James Harden and Jeff Pendergraph to the NBA, Herb Sendek’s team simply restocked, took some lumps early, and then came together to finish 12-6 in the Pac-10, good enough for second place. While the Sun Devils have to replace some of the veteran leadership that contributed to last season’s run, most notably point guard Derek Glasser and center Eric Boateng, it would surprise exactly no one if Sendek once again rounded this team into a serious contender in the Pac-10. Sendek got some good news in September when last year’s leading scorer, 6’6 wing Rihards Kuksiks (12.1 PPG, 3.6 RPG), announced he would be returning to Tempe for his senior season, rather than turning pro in Europe. That means the Devils will return three senior starters, with guards Ty Abbott and Jamelle McMillan (6.6 PPG, 3.4 RPG) rounding out the triumvirate. McMillan will slide into Glasser’s point guard spot, and Abbott and Kuksiks will maintain their roles as major deep threats for ASU; Abbott shot 40% behind the arc last season while Kuksiks shot 38%, a bit of a dip from the scorching 44% he shot as a sophomore. Sophomore Trent Lockett (6.7 PPG, 3.4 RPG) had flashes of brilliance as a freshman last season, and should get more opportunities as a bouncy slasher this year, but he’ll get pressed for minutes by a couple members of Sendek’s seven-man recruiting class. Keala King is the big name in the class, a 6’4 scorer, but junior college transfer Carrick Felix, who was once bound for Duke, should also challenge for minutes at a crowded wing spot. However, there is a distinct lack of experienced big men on the roster, with 7’0 sophomore Ruslan Pateev (2.1 PPG, 1.9 RPG) the only returning true big, a weakness which could be the undoing of a talented Sun Devil squad. California: To say the Golden Bears lose everybody from last year’s conference championship team is only a slight exaggeration. Last year’s top four leading scorers graduated, the sixth leading scorer was dismissed from the team, and in one way or another, numbers eight through ten are gone as well. Only two players return who played more than seven minutes per game last season: junior guard Jorge Gutierrez (5.5 PPG, 3.0 RPG, 2.7 APG) and senior forward Markuri Sanders-Frison (3.3 PPG, 3.0 RPG). Junior forward Harper Kamp (3.8 PPG, 3.2 RPG in 2008-09) also returns after taking a medical redshirt last season due to knee surgery, but the real hope for the future in Berkeley comes from a five-man freshman class, highlighted by point guard Gary Franklin and wing Allen Crabbe. Sophomore point Brandon Smith (0.9 PPG, 0.9 APG) may also figure in a backcourt rotation that has yet to sort itself out, but expect head coach Mike Montgomery to get the most out of that talented, if inexperienced quartet. If pressed to pick one guy who would step forward as the leader on this team, Gutierrez would be the logical pick, an exciting and aggressive player who is not afraid to draw the ire of opposing players and fans with his physical defense punctuated by a flop every now and then. Gutierrez took a back seat to last year’s senior class, but in their absence, he should become a more vocal leader and a more aggressive offensive player. USC: The Trojans are the other team in the conference besides Cal that does not return at least 50% of their scoring from last season, but while there isn’t a whole lot of proven depth here, the cupboard is not completely empty for head coach Kevin O’Neill. Junior forward Nikola Vucevic is back from a season in which he won the Pac-10’s Most Improved Player award and the rebounding title, and he’ll be paired with another stout rebounder, senior Alex Stepheson (8.4 PPG, 7.2 RPG), along USC’s front line. Senior wing Marcus Simmons (3.0 PPG, 2.0 RPG) and senior point guard Donte Smith (3.8 PPG, 1.1 RPG) are the only other returnees of note, but the Trojans welcome in some promising new blood, a group of four freshmen and an incoming transfer, from whom they expect immediate help. The transfer is point guard Jio Fontan, who will be eligible after the first semester, and upon whom there are great expectations. He was the Atlantic 10 freshman of the year two years ago at Fordham, when he averaged 15.3 points per game. Until Fontan is eligible, expect lightning-quick 5’7 freshman Maurice Jones to run the offense. Classmates Bryce Jones and Garrett Jackson will compete for minutes at the wing, with fellow freshman Curtis Washington providing depth behind Vucevic and Stepheson. It will take some time for the freshmen to get acclimated to the game at this level, and then another period of adjustment will follow Fontan’s eligibility, but should that fine-tuning go quickly, the Trojans have just enough talent here to have an impact on the Pac-10 race. Stanford: For head coach Johnny Dawkins, this season could be a little scary, as he returns most of a team that finished ninth in the conference last season, with the significant exception of their do-everything guy, Landry Fields, who led the team in scoring, rebounding, steals, blocks and minutes, and racked up the second-most assists along the way. With Fields now starting in the NBA, his production will be nearly impossible to replace. However, the good news for Dawkins, as he enters his third season with the Cardinal, is that he’s now starting to fill the roster with his own recruits, including a strong six-man freshman class this season. Easing the transition with the influx of new talent, Stanford does return last year’s Robin to Fields’ Batman: 6’4 junior shooting guard Jeremy Green, who averaged 16.6 points per game last season. Green is a deadly shooter, as evidenced by his school-record 93 threes last season, but he’ll be the main focus for opposing defenses this season, so he’ll need to get help elsewhere on the roster. The Cardinal do have three other returning starters, all juniors: forwards Jack Trotter (6.8 PPG, 4.5 RPG) and Andrew Zimmermann (4.4 PPG, 2.9 RPG), and point guard Jarrett Mann (5.8 PPG, 4.3 APG, 3.4 RPG). None of the three have proven much offensively so far – although Trotter, a former walk-on, was actually Stanford’s most efficient offensive player last season – so some of the newcomers will have a chance to make an impact immediately. The two most promising freshmen are 6’10 center Dwight Powell, a versatile big man, and 6’6 wing Anthony Brown, a prolific shooter. Dawkins also gets back junior forward Josh Owens (6.9 PPG, 3.6 RPG in 2008-09), a medical redshirt last season due to an undisclosed condition, who is a terrific athlete that could be a possibility for the second scorer role. While the immediate outlook for this program is not brilliant, Dawkins is starting to round this program into shape, and with no seniors on the roster, this is a team that could be a year away. Oregon State: The Beavers have posted two straight 14-win seasons under head coach Craig Robinson, not exactly an accomplishment to write home about in most situations. But, considering Oregon State only won 17 games in the two previous seasons combined, the First Brother-in-Law has definitely got things in Corvallis going in the right direction. And while the Beavs only sport two returning starters, they do boast six of their eight leading scorers among their returnees, including last season’s leading scorer, 6’2 senior guard Calvin Haynes (12.5 PPG, 2.3 RPG). In Robinson’s Princeton-style offense, lots of players see significant minutes and the scoring is balanced up and down the roster, but Haynes is far and away the most explosive offensive player, capable of scoring off the dribble or from deep. In the backcourt, he is expected to be joined in the starting lineup by freshman point Ahmad Starks and senior guard Lathen Wallace (5.3 PPG, 1.5 RPG), although sophomore guard Jared Cunningham (6.2 PPG, 2.0 RPG) got 19 starts at the point last season and redshirt freshman Roberto Nelson, last season’s big recruit, has high expectations upon him. Up front, a pair of sophomore big guys, Joe Burton (4.7 PPG, 4.5 RPG) and Angus Brandt (1.1 PPG, 1.1 RPG), have the edge on starting spots, with seniors Omari Johnson (4.7 PPG, 2.6 RPG) and Daniel Deane (3.1 PPG, 3.0 RPG) joined by incoming freshman Devon Collier and UTEP-transfer Eric Moreland in the frontcourt mix. While Haynes has the leadership spot on this year’s edition locked up, Beaver fans are most excited about the potential future backcourt of Starks and Nelson, the type of talented recruits that have been missing in Corvallis in recent years. Oregon: For many years, Dana Altman was a hot name in the spring when coaching jobs opened around the country. After turning Creighton into a yearly force in the Missouri Valley Conference, his name was routinely mentioned when high profile jobs opened up. He even went so far as to announce after the 2006-07 season, that he would be leaving for Arkansas, only to have a famous change of heart and renege a day later. Well, finally, after all those jobs came and went, Altman finally decided to leave Creighton for Oregon and their Nike connections and shiny new state-of-the art arena. Oh, and a roster left uninspiring by a few down recruiting years and a handful of defections this offseason, not to mention an NCAA investigation into possible “extra benefit” issues with center Michael Dunigan, who has since signed with a professional club in Israel. While Altman was brought in (after Oregon struck out with several other higher profile candidates) to rebuild the program, the immediate landscape is not bright. Junior point guard Malcolm Armstead (10.3 PPG, 4.3 APG) does return for the Ducks (after hemming and hawing most of the summer about possibly transferring), but the latest bit of bad news for the club was the announcement last week that 6’8 junior power forward Jeremy Jacob (7.5 PPG, 4.8 RPG), the tallest player remaining on the team, had undergone arthroscopic knee surgery and would miss three to six weeks. One bit of good luck for Altman is that senior forward Joevan Catron (7.2 PPG, 6.6 RPG, 2.3 APG in 2008-09) will return from a medical redshirt year to finish up his career in Eugene. Catron, an undersized power forward at 6’6, led the Ducks in rebounds and assists two years ago as a junior. Oregon does return a handful of interesting players at the wing, including 6’5 senior LeKendric Longmire (7.5 PPG, 4.1 RPG), 6’4 junior Teondre Williams (6.4 PPG, 2.4 RPG) and 6’6 sophomore E.J. Singler (6.1 PPG, 4.3 RPG), some of whom will be forced into playing out of position due to the limitations of the roster. In short (and I do mean short), this could be an ugly first year for Altman, despite the opening of the gleaming new Matthew Knight Arena. However, Altman, with the backing of Nike U. and all of its benefits, should have the program climbing back up the conference standings beginning next season. 11/16 Arizona State @ New Mexico (7pm PST, Vs.) – The Sun Devils invade the newly renovated Pit in Albuquerque, days before New Mexico repays the Pac-10 with a visit to Berkeley. 11/27 Arizona vs. Kansas in Las Vegas (7:30pm PST, ESPN) – This is likely the best chance for a Pac-10 team to get a win over Kansas in any of the conference’s four attempts this season. The others occur on: 12/2 when UCLA travels to Lawrence as part of the Big 12/Pac-10 Hardwood Series, 12/18 when USC makes the same trip and on 12/22 when Kansas visits Cal. 12/2 Arizona State @ Baylor (4pm PST, ESPN2) – An interesting matchup of styles in the Big 12/Pac-10 Hardwood Series as Baylor’s wide-open attack will go up against Herb Sendek’s much more measured pace. 12/5 Richmond @ Arizona State (11am PST, Fox Sports Arizona) – The Sun Devils host the Spiders, but for some reason they have to do so at a far more natural time of day for the East Coast squad. 12/8 Gonzaga @ Washington State (8pm PST, FSN) – Ken Bone’s squad gets to make its case as this season’s best team in Eastern Washington, although they’ll find Elias Harris and company no pushover. 12/11 Washington @ Texas A&M (1:30pm PST, ESPN2) – While the toughest road trip for the Huskies in the non-conference slate will be their potential matchups in the middle of the Pacific with teams like Kentucky and Michigan State during Thanksgiving week, this rematch is Washington’s toughest confirmed non-conference battle. 12/11 Arizona vs. BYU in Salt Lake City (3pm PST, BYUTV) – The first of consecutive neutral-site BYU vs. the Pac-10 games (the Cougars face UCLA a week later at the Wooden Classic in Anaheim), the Wildcats should expect something far short of a neutral crowd. 12/19 Arizona @ North Carolina State (1:30pm PST, FSN) – The Wildcats go across country to face the young and talented Wolfpack, a good test for Sean Miller and his squad with conference play around the corner. 12/22 Washington State vs. Mississippi State (12pm PST, ESPNU) – In the opening round game of the Diamond Head Classic, the Cougs get a crack at the Bulldogs and their newly-eligible and long-awaited big man, Renardo Sidney. 2/5 St. John’s @ UCLA (10am PST, CBS) – Steve Lavin will again be patrolling the sidelines at Pauley Pavilion, this time in front of the visitor’s bench. But a 10am start for the home team? 12/31 Washington @ UCLA (1pm PST, FSN) – Maybe the most attractive matchup of the opening weekend of conference play, but new Bruins point guard Lazeric Jones will have to prove himself against the defensive intensity of the Husky guards. 1/1 Arizona State @ Oregon (TBA) – The final scheduled game at Mac Court, the last hurrah for one of the nation’s venerable institutions before it gets replaced by the shiny, new, state-of-the-art Matthew Knight Arena. 1/27 UCLA @ Arizona (6pm PST, ESPN) – Arguably the fiercest basketball rivalry in the conference gets renewed, with both schools hoping to be in the mix for NCAA Tournament consideration. 2/13 Arizona @ Arizona State (6pm PST, FSN) – The battle for the Grand Canyon State should be a good one, but do the Sun Devils have anyone to control Derrick Williams? 2/19 Washington @ Arizona (3pm PST, ESPN) – If Arizona really can compete for the regular season title, they’ll need to defend their home court against the conference favorite. 2/27 Washington State @ Washington (7pm PST, FSN) – The Apple Cup, bouncyball edition, where the backcourt matchup between the Klay Thompson/Reggie Moore duo and Washington’s trio of guards should be worth a watch. 3/5 UCLA @ Washington State (TBA) – On the final day of the regular season, this could be a battle for positioning for the conference tournament, or even the NCAA Tournament bubble. With new conference commissioner Larry Scott having already proven over the summer that he is unafraid to mix things up in order to promote his conference, there are other changes on the horizon for the conference, beyond just the addition of the two new schools. First, perhaps as fallout from the summer of conference realignment, the Big 12/Pac-10 Hardwood Series will come to an end after their four-year contract wraps up this season. While the series was never as well-planned or as exciting as the ACC/Big Ten Challenge (the games were spread out over a month and two Big 12 teams played two games as a part of the challenge every season), it is a shame to see it go as it did ensure matchups between teams from two of the traditional power conferences. It’s unknown as of now if there are plans for a similar event in the future, but one idea would be killing off that terrible SEC/Big East half-hearted effort at a challenge whenever that contract expires and get the SEC and the Pac-10 together for an intersectional challenge, given that, for the time being at least, both conferences have the same number of teams. Another interesting change around the conference is something of a response to the spotty attendance at the Pac-10 Tournament at the Staples Center. This year, for the first time, the conference will combine the men’s and women’s tournaments. While the first two rounds of the women’s tournament will still be played at the Galen Center on USC’s campus, the semifinals will move to the Staples Center and serve as a warm-up for the men’s semifinals in primetime. And then, on Saturday, the women’s final will be the matinee to the men’s final. It remains to be seen if this maneuver will in any way increase the attendance or buzz in the arena for the men’s games, something that has been missing the last couple of years. One of last Selection Sunday’s stories was the end of Arizona’s 25-year streak of tournament appearances. In the same vein, last season was the first time since 1987 that the Pac-10 sent fewer than three teams to the Big Dance, which tells you about all you need to know about the conference’s NCAA Tournament history. With a 238-158 (.601) record all-time record which includes 33 Final Fours, 20 national title game appearances and 15 National Championships (tops in Division-I), the Pac-10 has plenty of March (and April) history to fall back on, despite last season’s troubles. Not all that long ago, just within the past couple of years, the Pac-10 was littered with talent. Up and down the west coast, there were great college basketball players: Kevin Love, Darren Collison, Russell Westbrook and others at UCLA, O.J. Mayo and a talented bunch across town, the Lopez twins at Stanford, Derrick Low and Kyle Weaver up on the Palouse, James Harden dueling with Jerryd Bayless and Chase Budinger out in the desert, just to name a few. Nowadays, you look up and down the rosters, and yes, there are some good players, but in trying to put together an All-Pac-10 team, you wind up looking at guys like Jeremy Green and Nikola Vucevic, and while there is absolutely nothing against those guys, it is clear to see that the talent level in the conference has dropped, and pretty drastically. Between the 2008 and 2009 NBA Drafts, 21 Pac-10 players were picked, 13 of them in the first rounds and eight in the lottery. By comparison, last year the conference had two players picked in the draft and one in the first round. And as of October 18th, the Draft Express 2011 mock draft shows only UCLA’s Tyler Honeycutt and Malcolm Lee as first-round picks in next year’s draft (and frankly, the inclusion of those two as potential first-round picks at this point frightens and confuses me), with Washington State’s Klay Thompson a second-rounder. Quite simply, the talent level in the conference is down. And with only a handful of this year’s top 100 incoming recruits headed to Pac-10 schools (ten according to Scout, 12 according to ESPNU), and Pac-10 schools having only gained commitments from 10 of ESPNU’s top 100 for 2011, there is no quick fix coming. Given the abundance of quality coaches around the league, you have to figure those players are going to come eventually, and certainly there are several coaches around the conference capable of coaching up their kids, but for the short term at least, the Pac-10 simply cannot match the talent on the floor in the other Big Six conferences. This entry was posted on Monday, November 1st, 2010 at 9:13 am by Brian Goodman	and is filed under 2010-11 conference previews, 2010-11 Season Preview. Tagged: abdul gaddy, Abe Lodwick, Ahmad Starks, alex stepheson, allen crabbe, andrew zimmermann, Angus Brandt, anthony brown, arizona, arizona state, Aziz N'Diaye, ben howland, Brandon Smith, Bryce Jones, cal, calvin haynes, carrick felix, craig robinson, Curtis Washington, dana altman, Daniel Deane, darnell gant, deangelo casto, derek glasser, derrick williams, Devon Collier, Donte Smith, Dwight Powell, ej singler, eric boateng, eric moreland, Garrett Jackson, Gary Franklin, harper kamp, herb sendek, isaiah thomas, Jack Trotter, jamelle horne, Jamelle McMillan, Jared Cunningham, jarrett mann, jeremy green, jeremy jacob, jerime anderson, jio fontan, Joe burton, joevan catron, johnny dawkins, jorge gutierrez, Josh Owens, josh smith, Justin Holiday, Keala Kling, ken bone, Kevin Parrom, klay thompson, Kvin O'Nill, kyle fogg, kyryl natyazhko, lamont jones, lathen wallace, Lazeric Jones, lekendric longmire, lorenzo romar, malcolm armstead, malcolm lee, marcus capers, Marcus Simmons, Markuri Sanders-Frison, matthew bryan-amaning, Maurice Jones, Michal Dunigan, mike montgomery, nikola vucevic, omari johnson, oregon, oregon state, quincy pondexter, reeves nelson, reggie moore, rihards kuksiks, roberto nelson, Ruslan Pateev, Scott Suggs, sean miller, Solomon Hill, stanford, Teondre Williams, terrence ross, trent lockett, ty abbott, tyler honeycutt, Tyrese Breshers, ucla, usc, venoy overton, washington, washington state. You can follow any responses to this entry through the RSS 2.0 feed. You can leave a response, or trackback from your own site.